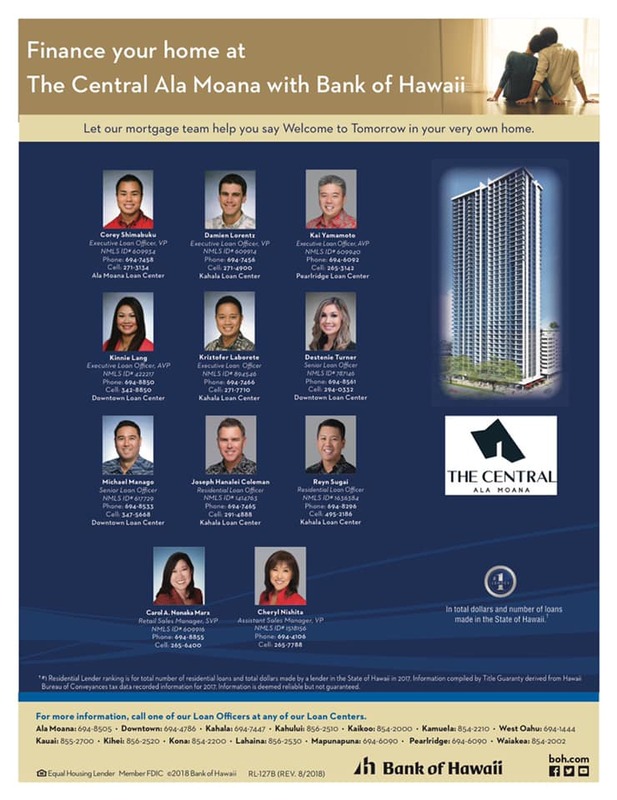 DISCLAIMER: THEDREAMTEAMHAWAII.COM IS NOT THE OFFICIAL WEBSITE FOR THE CENTRAL ALA MOANA CONDO PROJECT. THE PROPOSED PROJECT IS BEING DEVELOPED BY SAMKOO HAWAII LLC. ALL INFORMATION IS SUBJECT TO CHANGE. 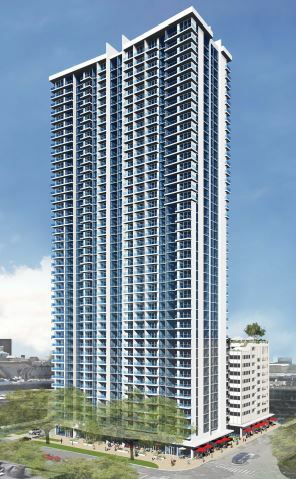 The Central Ala Moana built by SamKoo Pacific LLC will be SamKoo's second tower located on the corner of Kapiolani Boulevard and Kona Iki Street. This Central will be a 43 story building and will feature 512 units. They will set aside 60% (310 units) towards affordable housing and the other 40% (202 units) will be sold as market units. Construction to start 2nd quarter of 2019. ​There will also be 5 high speed elevators to service the building. On the higher floors the Makai/Ocean facing studios combine with the adjacent unit to become a larger unit. All units will come with at least 1 parking stall. The studios, 1-bedrooms, and 2-bedrooms will have 1 parking stall. Two bedroom units will have the option to purchase a 2nd parking stall (price TBD). 3-bedroom units will come with 2 parking stalls. 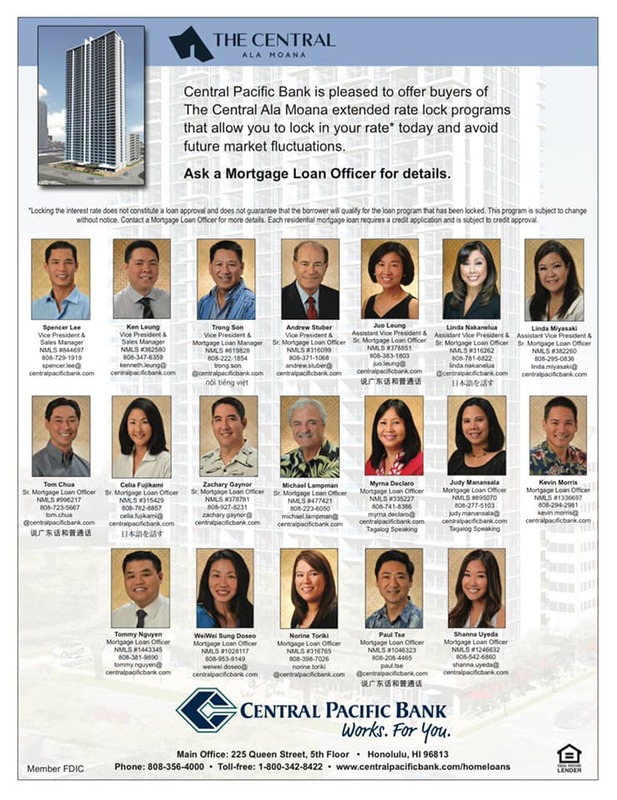 The Central Ala Moana will have 10 stories of parking and will have approximately 26 guest stalls along with 9 planned commercial retail units on the ground floor of the building. 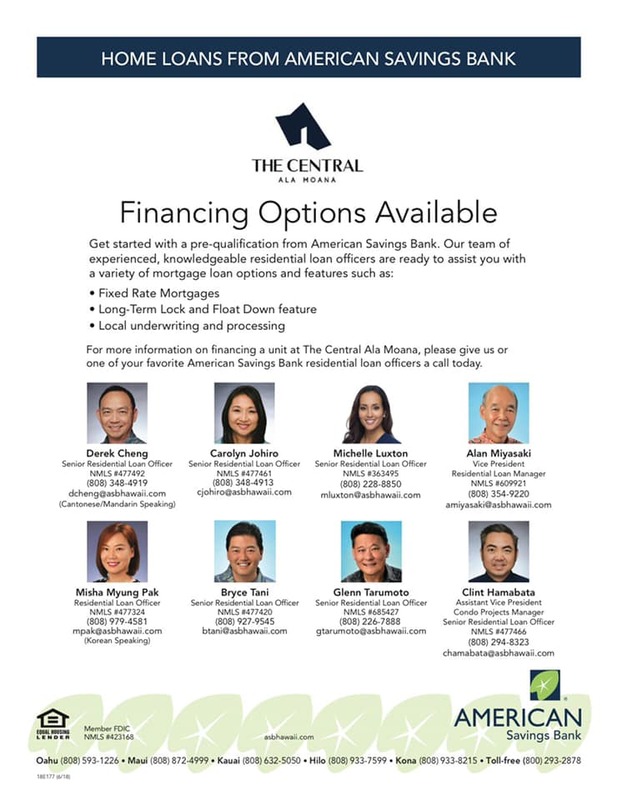 The Central Ala Moana will have a mix of Mountain and Ocean view units. 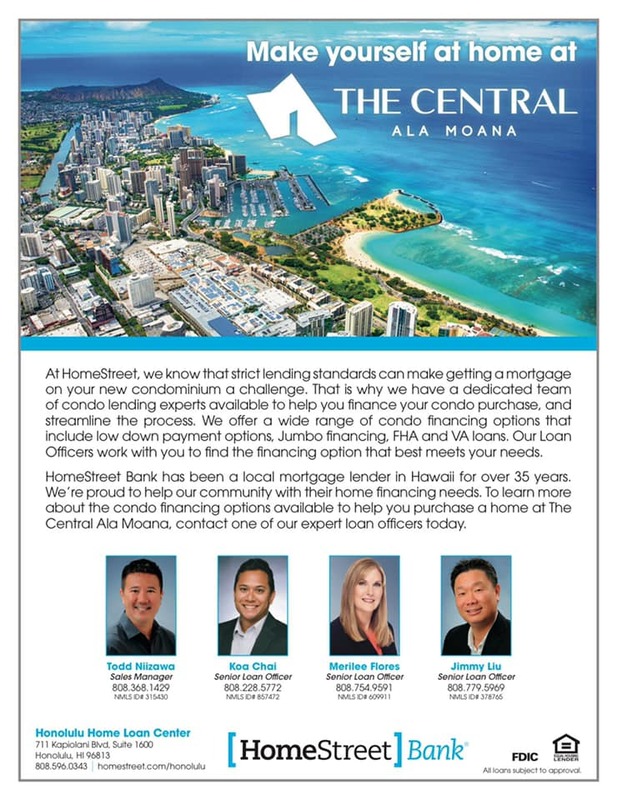 The Ocean side will definitely be the more costly of the two sides but will boast incredible Ocean Views overlooking Magic Island, Ala Wai Boat Harbor, and Ala Moana Beach. This side will most likely be the more popular of the two because the only thing in front is Park Lane and Ala Moana Shopping Center and there is less of a chance that something will be built in front of you. 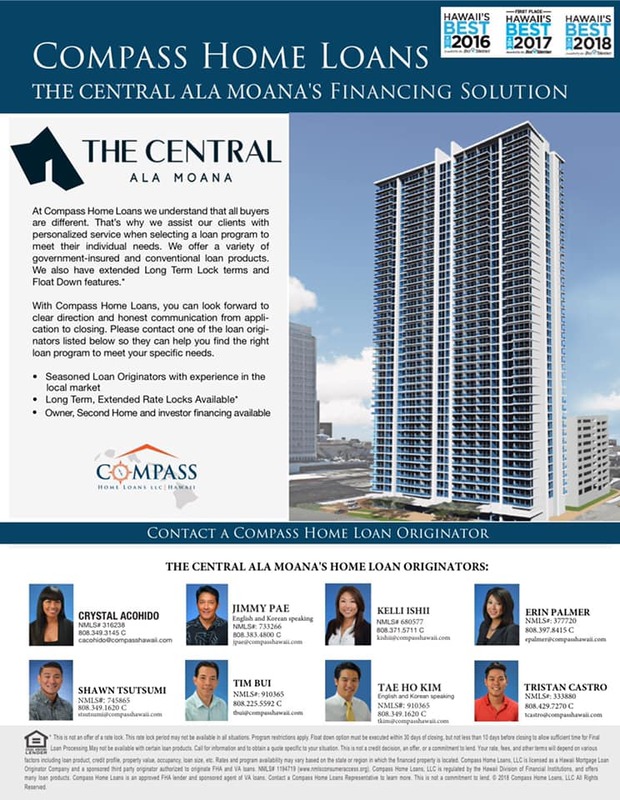 There will be 310 affordable housing units in The Central Ala Moana. This building will be a little different from it's predecessor Kapiolani Residence. 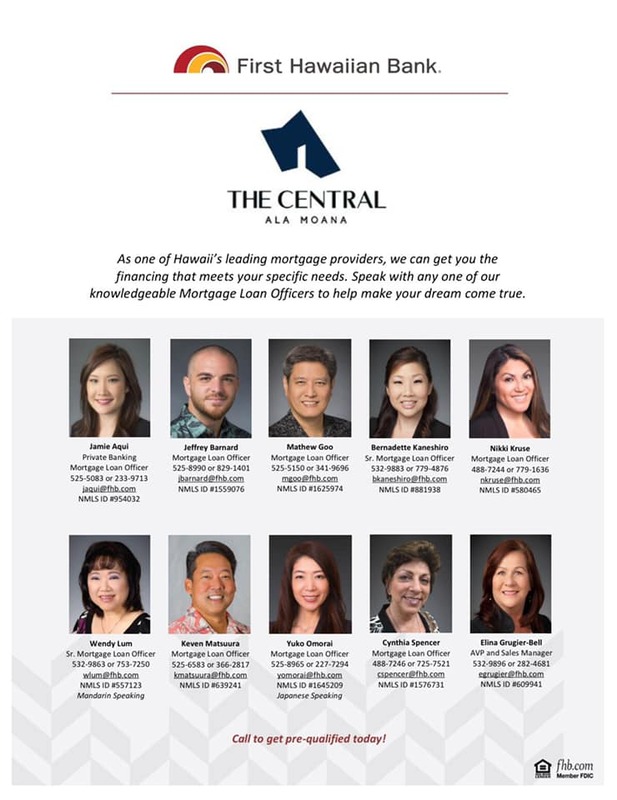 This time around buyers will be allowed to make up to 140% of the 2018 area median income (Kapiolani Residence was up to 120%). Per HHFDC the area median income will be classified by family size and you may use the table below see which bracket you fall under. The important thing to remember is that you NEED to be within the 80% to 140% AMI range. Part of the application will be to get a project pre-qualification letter from one of the following lenders. It is highly advised to start as soon as possible as they will get busy the longer you wait. Remember, you do not need to use the person you pick for the loan. You can use whoever you want even if the lender or bank isn't listed as a project lender. 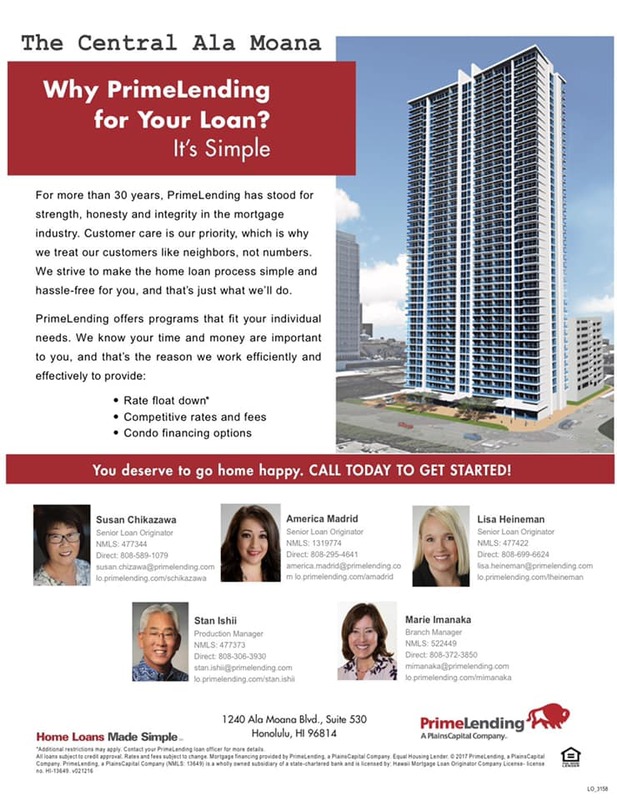 If you need advice on picking a lender feel free to reach out to us. Affordable Housing is for buyers earning 140% and below of the Area Median Income. If I am a single person, can I purchase a two or three-bedroom unit?